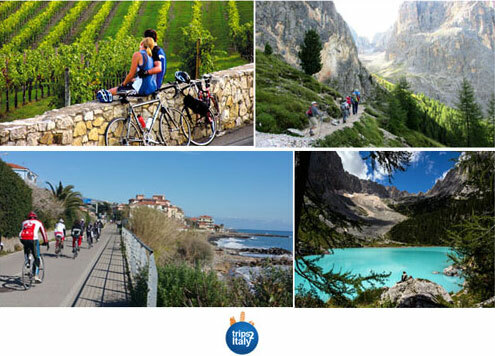 Take An Active Trip To Italy and Ski, Hike, Bike, Scuba & More! In addition to its status as an epicenter of culture, art, history, and architecture, Italy is an ideal destination for active travelers looking for new and exciting experiences. With a diverse landscape – including high mountain peaks, spacious countryside, rolling hills and undersea wonders – Trips 2 Italy can customize a dream active vacation for travelers of all interests and skill levels. Only five of Italy’s 20 regions are entirely landlocked, meaning much of the boot-shaped country is graced with stretches of scenic coastlines. The Adriatic, Mediterranean, Ionian, Tyrrhenian, and Ligurian seas wash upon the shores of Italy, each offering views of sparkling waves as well as miles of beaches and endless water activities to enjoy. No matter what oceanside experiences one is looking for, there is an ideal coastal locale in Italy. Take a boat to the Pontine Islands, surf some waves along the Leghorn coastline, windsurf in Porto Pollo, or simply relax on the beaches of Sicily. From the elegant Italian Riviera to the famed Isle of Capri, the coastline of Italy offers some of the world’s premier seaside destinations. Featuring crystal clear waters, incredible coral reef formations, hidden aquatic grottos, and an abundance of ocean life, the waters that surround Italy are perfect for scuba diving and snorkeling. Everyone from experienced divers to first-time snorkelers will enjoy areas such as Capo Vaticano, the Aeolian Islands, and the coast of Sardinia. Prime dive spots located all over the coast of Italy offer supreme underwater experiences. 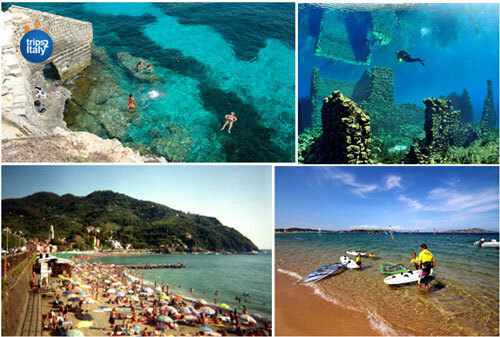 The most highly-traveled coastal destination in Italy for scuba diving and snorkeling is Campania. Serious, even professional, divers have been enjoying the pristine waters and beautiful coast of Campania for years. Rocky cliffs tower above the sapphire sea, providing above-the-water views that are just as mesmerizing as those underwater. Water fun in Italy is not limited to the ocean. In Lombardy – a region of Northern Italy – travelers can enjoy the picturesque collection of lakes known as the Italian Lake District. 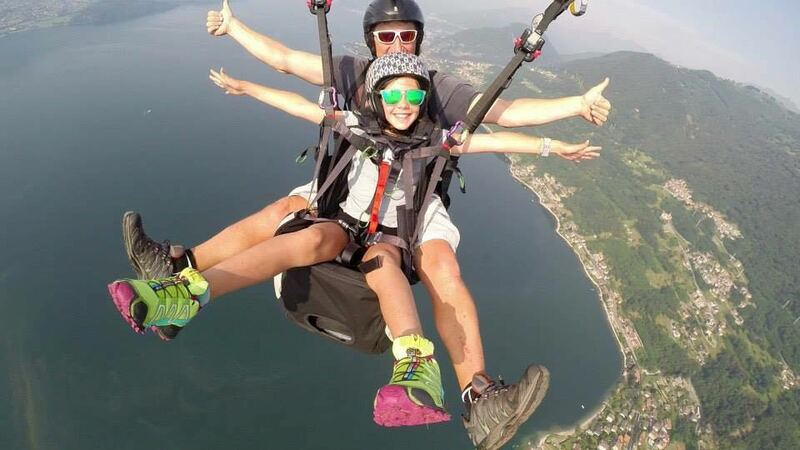 Including Lakes Maggiore, Como, Garda, Iseo, Orta, and more, the Lake District offers water sports such as swimming, windsurfing, canoeing, and waterskiing set against the backdrop of the lake’s lush scenery. The towns which dot the coastlines range from quaint, medieval villages to opulent villas – giving travelers a variety of culture to experience. With expansive landscapes that include lush hills, active volcanoes, stunning mountain ranges, and cliffside paths, Italy offers hikers and bikers of all skill levels near-endless opportunities to become one with nature. Throughout Italy, active travelers can enjoy a variety of trails in the Dolomites, Italian Alps, and Apennines mountain ranges. Experts will appreciate the high-altitude trails available, while beginners will enjoy more easily-accessible but no less magnificent trails. From fields of wildflowers at the base of the mountains to once-in-a-lifetime views from the peaks, the ranges of Italy make for an unforgettable outdoor experience. If ocean scenery is preferred, Italy offers glistening coastlines in nearly every region. Hiking and biking trails often run through charming villages along the coast, giving travelers an immersive cultural experience in addition to magnificent seaside views. Hands down, the most well-known and highly traveled hiking destination in Italy is that of Cinque Terre. Designated an UNESCO World Heritage Site, the trails of Cinque Terre are considered some of Europe’s most gorgeous nature paths. While some trails can be completed in a matter of hours, travelers often choose to spend a few days traversing the land casually, crossing through various villages and enjoying glimmering cliffside views of the Mediterranean. This seven-mile-long hiking trail is the most popular way to experience Cinque Terre. Ideal for beginners, it connects the villages of Monterosso and Riomaggiore and passes through each of the five villages that make up Cinque Terre. This path con sists of four sections, including the famed Via dell’Amore (“Love Path”). Whether trekking expert paths up to the peaks of the Dolomites or taking a relaxing bike tour of the Tuscan countryside, hiking and biking is a fantastic way to experience Italy’s panoramic views and natural beauty. 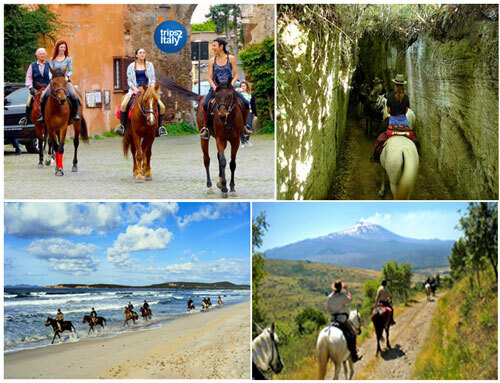 One of the most unique ways to enjoy the varied landscape of Italy is on horseback. Boasting protected national parks, thousands of miles of oceanside coastline, rolling hills, lush forests, and sprawling mountains, riders of all skill levels will find that horseback riding in Italy will provide excellent trail experiences. Wide open views, intriguing terrain, and untouched country await in regions all throughout Italy. For beginners and seasoned riders looking for the chance to fully immerse themselves into the wonders of nature, farms and ranches across the country offer multi-day secluded experiences away from the hustle and bustle of the usual tourist destinations. For city travelers looking to have an afternoon away, countryside suburbs offer afternoon rides to enjoy the beautiful scenery. Whether riding through the rolling hills of Tuscany like a true Butteri (Italian cowboy) or traversing the Nebrodi Mountain woods in Sicily, Italy’s diverse landscape promises an equestrian vacation unlike any other. The variety of Italy’s winter vacation spots are a plus as well. 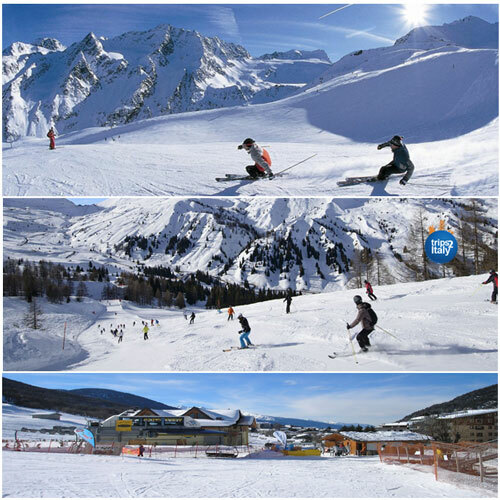 From world-renowned resorts in the Aosta Valley, to storybook villages in Trentino Alto Adige, to ski towns in Piedmont, skiers and snowboarders can experience slopes on the Italian Alps, the Apennines, the Dolomites, and even Mt. Etna – an active volcano. No matter where one chooses to ski in Italy, the views, weather, and welcoming locals make for an impressive Winter getaway.